As it turns out, Tommy is currently touring with a new signature Maton guitar, a new AER amp and with projects aplenty planned for the immediate future. One glance at his website will confirm that TE is rarely still for any length of time. He tells us that he does, on average, 300 shows a year, travelling the world and playing to audiences that are continually blown away by his virtuosity and sheer energy. That evening, we attended the gig (well, it wasn’t far to walk!) and Tommy’s support for the night was the excellent Clive Carroll who refers to TE affectionately as “The Abominable Showman”. The concert was a tour de force of consummate performing skills from the outset, with the highlight of Clive joining Tommy at the end of the evening for some ferocious duets. We left exhausted, but happy. Earlier in the day, we asked Tommy about as many aspects of playing as we could: stage performance, recording, even digging deep into how he sets up his gear on stage. But first, what about that new signature Maton? “Actually I’ve got three new Matons that were made for me. Last time I was in Australia I did a masterclass out at the Maton factory and while I was there Andy Allen, who runs the custom shop, had built a new series of guitars using this new bracing system that he’s developed. "The bracing system is a lot lighter. It’s living a little dangerously because it’s the bare minimum and I felt a great difference acoustically with the guitar. I just thought the note had so much more power to it. It still felt like all my other Matons but it just had a better voice and so what he did is he had six new guitars ready for me to play and I could either take them all or I could choose what I needed. “I didn’t want to be greedy and just take six guitars so I took three and the one that’s in these photos is my new number one. And then there’s another one called a TE Traditional which is a new shape for them. It’s slightly bigger in the body and it has a cutaway and a slightly deeper, more open sound. "Then the other one that I chose was another experimental one which is thinner in the actual body itself. So what I decided is I would use the bigger bodied one with the cutaway for all my dropped D and dropped G stuff and then the one that has the thinner body I use detuned down a whole step and I put 0.013 to 0.056 strings on it and just kind of keep the neck fairly straight. "I use it for tunes like Somewhere Over The Rainbow where I use a lot more pickup than mic because I’m using more reverbs. I tend to use more mids and more pickup and then, when you put that in the PA with reverb and a little delay, it speaks just right. If you use too much mic the reverb gets a little splashy, but that’s the only guitar that I do that with. The smaller body with the big strings and the lower tuning speaks really well and people love the sound that I get off that guitar. When you go to Maton what sort of things do you ask them for? Do you have a specific nut width and things like that? “Yeah, it has a slightly different tone than normal so it’s warmer and bigger – and the reverbs and delays are the ones that I particularly like. The delay is taken from the Alesis Midiverb 2 that I used to use and the reverbs are from Lexicon. How do you decide which guitar you’re going to use for a particular song? “I play the song and have a listen to it with maybe three different guitars. I’ll play it on my main Maton and then I’ll pick up my Larrivée or a Martin D-28 and have a listen to that and see. "It depends what I need; for instance, on the latest album, It’s Never Too Late, there’s a version of One Mint Julep, which is an old tune I learned back in the early 70s and so I wanted to tune down a guitar and play it with that almost delta blues approach – and tuning down means you have to have a guitar that really speaks. If you tune down a guitar that doesn’t it just sounds awful. So you have a few guitars that you choose between for studio use? “Yeah, a Gibson J-45, Martin D-28, the Larrivée, the Tom Williamson… I have another guitar made by a guy named David Taylor and I used that on my Christmas album a few years ago and it’s a cross between a Martin and a Gibson. It’s right in the middle and it has a real sweet sound and a beautiful voice for when I’m playing single-line melody. When you go in to the studio do you have preferences for what mics you use and things like that? “I have a preference for which engineer I want [laughs]. Kim Person did a lot of my recordings in the early days. She used KLM 184s and Schoeps microphones as well. When I work with Marc DeSisto, who did my last album, and all the Christmas stuff I’ve done recently, he uses mostly a KGC 12 and a Neumann – I think it’s a 149, something like that. "When we recorded the track It’s Never Too Late, I just used one mic on the guitar. It just was so beautiful and open and I recorded that at Marc’s house. His wife went away for the weekend and we had organised for me to record four songs at his home studio. It’s all about the engineer, for me. "He liked the sound in the lounge room so we took the rug off the floor and just left the floor wooden and I brought in a chair and he set the mic up. I just moved around a little bit until we were both happy with it. One mic, you know? "So normally if you go back to my early stuff like the Only album, that was four mics and a direct signal as well as an amp signal. I think we used 12 tracks for one guitar sound for that album and it was mixed on one of the most expensive boards in the world. "The guy who used to work at Abbey Road, Richard Lush, used to work with Paul McCartney, he mixed that album and he did a great job. “So it’s all about the engineer, for me. If you’re going to record, your greatest investment is the right people to do it with you, otherwise you’re settling for the mediocre. "I remember when I was recording tracks in Australia, I would immediately send them to Marc DeSisto and have him mix them and I would give him certain instructions but then I would just let him do his thing and he would send me four or five versions. One with more bass, one with less reverb… and I would then have a listen to everything and choose what I wanted. You were saying earlier you travel with your own sound engineer. “Absolutely. It’s everything; it’s my world and I’m trying to keep it as simple as possible on stage. A big mistake that too many acoustic players make is they have too much technology going on and they rely too much on that technology. You’ve got to get big, sweet-sounding signals on stage and then put that into the PA because that’s what the people hear. They’re not hearing what’s happening on stage, they’re hearing what comes out of the PA. If you run a PA with everything flat it should sound great. "So Steve and I start with everything flat, so you’ve got the right amount of bass, the right amount of mids, the right amount of highs. Nothing’s over-EQ’d or exaggerated. "If you run a PA with everything flat it should sound great. You should be starting with, ‘Wow, this is already sounding good!’ you know? I can always hear EQ; if I go and hear someone at a show and the sound man’s really EQ’d the hell out of everything I can hear it straight away. I don’t want to hear that, I want to hear the instrument and I want to hear the music. That’s what I’m going for – simple sound. "So I have my AER amp, that’s one signal – a direct signal. I run my guitar flat out: pickup on 10, mic on 10. That’s how I get the sound. Normally what we’ll do is we’ll turn things up to the level it will be when the room’s full of people and then we’ll just find anything that might be a little lump, like 250 cycles – around the A note – can be a little bumpy and he can just EQ that until everything’s even. So, with the sound in good hands, you are free to concentrate on playing? “Yes. Basically I’m looking for one good sound and once we’ve got that and then it’s just a matter of me trying to play my best. That’s why I always tell young guys, ‘If you can afford it, get a decent amp’. "Don’t go on stage and plug into a DI and expect the sound man to get you a sound. It’s not his job. It’s your job to get your sound together. My amp is set bass on 6, middle on 6, treble on 6 – it’s right in the middle. Do you run a stereo signal on stage? “It’s not a stereo output. I didn’t want stereo output, I just wanted a normal guitar cable plug-in-and-go and onboard I’ve got separate controls for the pickup and the mic so I can turn the mic off if I want, or the pickup off, or I can do a mix. "Then I’ve got a master volume so if I like the sound but I need less of everything, I can just turn it down a little. I can sweep the mids and find what I like and boost it or cut it and that’s all on that little outboard thing on the top of the guitar. Do you alter your guitar settings between a ballad and an up-tempo tune? 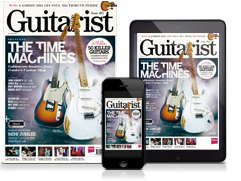 You’re one of the busiest guitarists out there – what have you got lined up for the rest of 2017? “I’ve got so much in the pipeline right now, it’s wonderful. I’ve got the album I’ve finished with John Knowles and it’s an album of love songs. He’s playing nylon-strings, I’m playing my Maton just with a mic on it and some beautiful arrangements that we’ve spent a lot of time on. "My next main project is a duets album with various artists and it’s aimed at the Americana market. So I’ve done two tracks with Ricky Skaggs, I’ve done a track with Rodney Crowell, Jason Isbell and I have done two tracks together. David Grisman and I have done six tracks together with Brian Sutton and I’m just waiting to hear back from Alison Krauss and other artists like that. "I’ve written to James Taylor as well because I want to do something with James. That’s got to be finished by May this year because I want to release that this year as my next major project because next year we’re aiming for the Grammys and the Americana awards. "I’ve got a couple of new songs that I’ve written in the last three months but I don’t have enough new material for a new solo album yet so I’m hoping that’s going to happen in the next 12 months, sometime in the middle. I’ve actually built into the schedule this year a lot of time to do other things. Get these other projects finished.